Recently, I have been arguing with people opposing the use of vaccines. One google search query led me to an article claiming that are death cases by measles vaccines. The article goes on claiming that measles vaccines kill over 100 people annually. This graphs claims that the vaccine was introduced after the disease was under control already, arguing it was pointless to have the vaccination program. I am really skeptical of the two claims above. I know that there was an outbreak in 1990 of measles but I would like to know if the following is true. Let me compare that data (i.e. a death rate of less than 1 in 100,000) with data reported elsewhere. 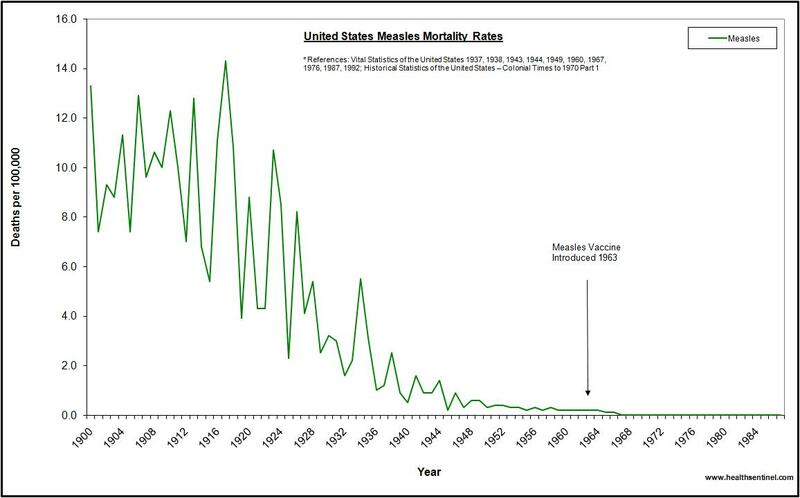 In the United States, mortality from measles decreased from 25 per 1000 reported cases in 1912 [209, 210] to 1 per 1000 reported cases in 1962 . In New York State, measles mortality decreased by >15-fold long before the introduction of measles vaccination (figure 2) . US and UK case-fatality rates were ∼1 per 1000 reported measles cases from the 1940s through the 1980s 3, 124, 133, 211]. During the past 13 years in the United States, the case-fatality rate has averaged 3 per 1000 reported measles cases (table 2). This increase is most likely due to more complete reporting of measles as a cause of death, HIV infections, and a higher proportion of cases among preschool-aged children and adults. A naive reading of the data I referenced would suggest that the death rate is 50 times higher than claimed in the OP (because mine measures deaths per 1000 instead of deaths per 100,000 -- compare "25 per 1000 reported cases in 1912" with the approximately 12 per 100,000 shown in the graph in the OP). ... then that would explain the lower death rate per year (i.e. lower by a factor of 50). For example, compare with this List of causes of death by rate which claims that the death rate for all causes (cancer, all accidents, heart disease, all infection diseases, war, etc.) is only 916 per 100,000. Therefore I think these two sets of data are more-or-less in agreement. This is a bit higher than "∼1 per 1000 reported measles cases from the 1940s through the 1980s", which suggests that the disease is not exactly "under control" due to 21st century medicine (except by vaccines, if you accept vaccination). Developing countries. Measles remains a leading cause of death and disability-adjusted life-years lost . Community-based studies during the 1970s and 1980s revealed measles case-fatality rates of 3%–34% [215–217], 10–20 times those in industrialized countries. In 2000, the World Health Organization estimated that 30–40 million persons developed measles, resulting in 777,000 deaths, most in sub-Saharan Africa . This estimate was based on expected case fatality rates. Another approach based on verbal autopsies gives a lower estimate of the number of measles-associated deaths [219, 220]. High case-fatality rates in developing countries are due to a young age at infection, crowding, underlying immune deficiency disorders, vitamin A deficiency, and lack of access to medical care. Before the introduction of measles vaccines, one-third of children in many developing countries were infected in the first and second years of life, and most children were infected before age 5 years [195, 221, 222]. An estimated 125 million preschool-aged children are estimated to have vitamin A deficiency, placing them at high risk for death, severe infection, or blindness as a result of measles . In recent years, the use of vitamin A therapy for children with measles, prompt antibiotic therapy for pneumonia, and older age at time of infections have contributed to the lower case-fatality rates (⩽1%) in some developing countries (figure 3) 223–228]. In Latin America  and southern Africa , achieving high vaccination rates has reduced measles mortality in these regions to near zero. Note that "death" is not the only potential complication which results from measles: there's also a also risk of non-fatal pneumonia, encephalitis, ocular complications (keratitis, corneal scarring, blindness), and malnutrition. In summary, the numbers in the graph are true but the answer depends on what you mean by "under control": i.e. before vaccines were introduced, the disease was still pandemic, but they'd learned how to treat everyone who became ill, such that with enough medical care they could keep most people from actually dying of the disease. Not the answer you're looking for? Browse other questions tagged united-states vaccines .